A beautiful picture can reveal several stories. Most of the people keep on sharing their life stories via images on Instagram. Those who love to capture impressive photographs of nature and pets can share them online to highlight their creativity. The Instagram platform is more popular for sharing pictures containing quotes over the internet. If you are interested to grab the attention of followers to your profile, the inspiring quote type pictures can make your task easier. But for that, you will need some good quality quote maker tools. All your Instagram shares need a special look and to add classic graphics it is good to choose any of these top-rated quote maker tools. Although you may find many apps or desktop software to create Instagram quotes, here we are going to talk about online quote makers. They will not consume any space in your device memory as these tools are designed to handle everything online with cloud storage. This browser-based Instagram quote maker tool offers many interesting features to create quote containing images. 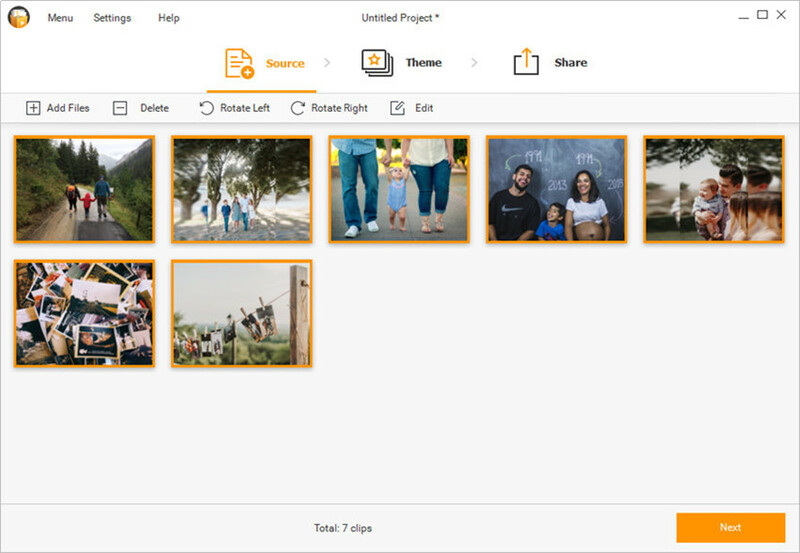 It gives a variety of options for uploading unique images; you can pick quote backgrounds from the software library, enter your words, and make adjustments for text size, color, and font. Users are also allowed to generate their own images for Instagram posts. The most amazing thing to know about FaceGarage tool is that it does not add watermark to images. You can easily create distraction-free, attractive stuff online. Here is another easy to use and quick browser tool for generating Instagram quote images. You can create beautiful posts by following a simple two-step process, choose your background image from the collection, type your quote and hit create button. Recite allows direct connection with many social media networks except Instagram, but you can easily save your images and share them as an Instagram post. However, the only trouble with this online tool is the addition of a visible watermark on the bottom of the image. This app is specially designed for creating Facebook covers with interesting inspirational quotes. There are around 35 symbols, 30 backgrounds and 20 different font choices that you can choose for your shareable images. You can preview all creations before finalizing them and it also assists in the easy adjustment of all symbols with intuitive tools. You will be happy to know that this app also allows users to put their quote on sale and it offers 30% profit to the creator for each paid sharing. Every graphic designer loves Canva due to its awesome features. Even if you are a beginner, this tool will appear intuitive with its user-friendly interface. You can create covers, simple quote images, creative graphics and much more on this online platform. The most impressive thing to know about Canva is that it is not limited to graphic design only; rather it can also provide you great tools for designing posters, PDF book covers and many more. Although you will easily find many free backgrounds and effects, but if you need advanced one, you can get them easily by paying only $1. If you are searching for a tool as effective as Photoshop but for free of cost, PicMonkey is definitely a great choice. Many bloggers prefer to use this image creator platform for developing pinnable graphics that can make their posts more interesting. You can also create inspiring quotes using PicMonkey. Even free users are able to access many interesting features; however, if you need more, you can easily switch to the paid version of it. This free web tool can assist you better to develop pretty images to grab the attention of your followers and targeted audience online. There is a variety of styles for easy selection and they can assist beginners as well to create some inspiring stuff like a pro. 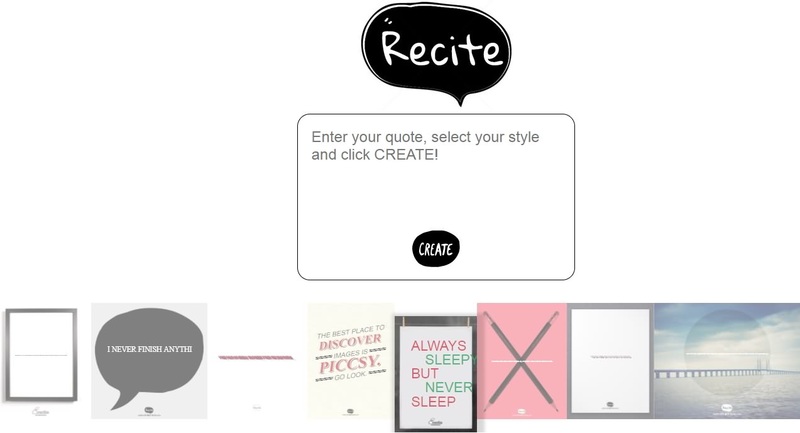 One unique feature of ReciteThis allows users to find quotes online when they are not able to give words to their imaginations. You can easily scroll on their library and choose an interesting quote to make your Instagram posts more creative. Quotes Cover is known for its fastest action to create picture quote so that users can instantly share their creative imaginations on Facebook and many other social media networks. There are so many stunning options but the effects appear little messy. The font combinations are quite impressive and you can easily choose different image sizes. 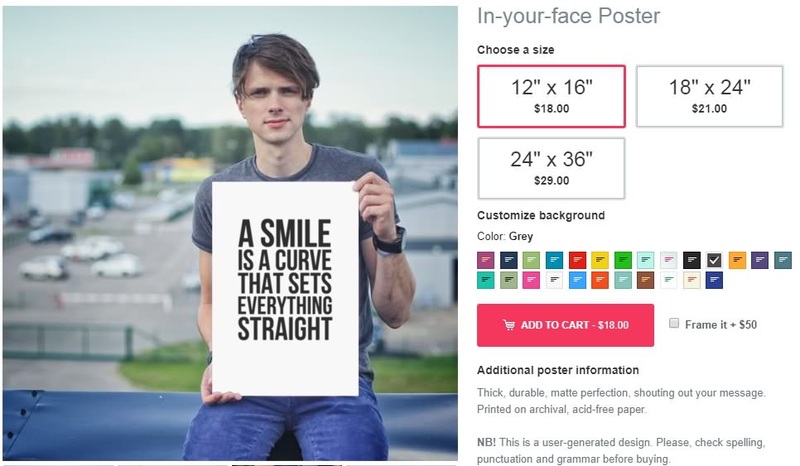 Quotes Cover allows users to create Google Plus covers, Pinterest size, simple square images and many other creative patterns. It is worth taking a tool to do some creative stuff online. Every Instagram lover has his/her own idea about quote images as per their interest. Few of you may prefer to go too professional with your shares by using standardized picture patterns and others may love to choose some funny and eye-catching backgrounds to entertain their followers. No matter what is your basic target behind your Instagram quotes, can choose any of these online tools to start your image creation fast. These apps are already used by millions of social media users and they are happy with impressive results. You can prefer to go online now and look for the best options to create an outstanding image. 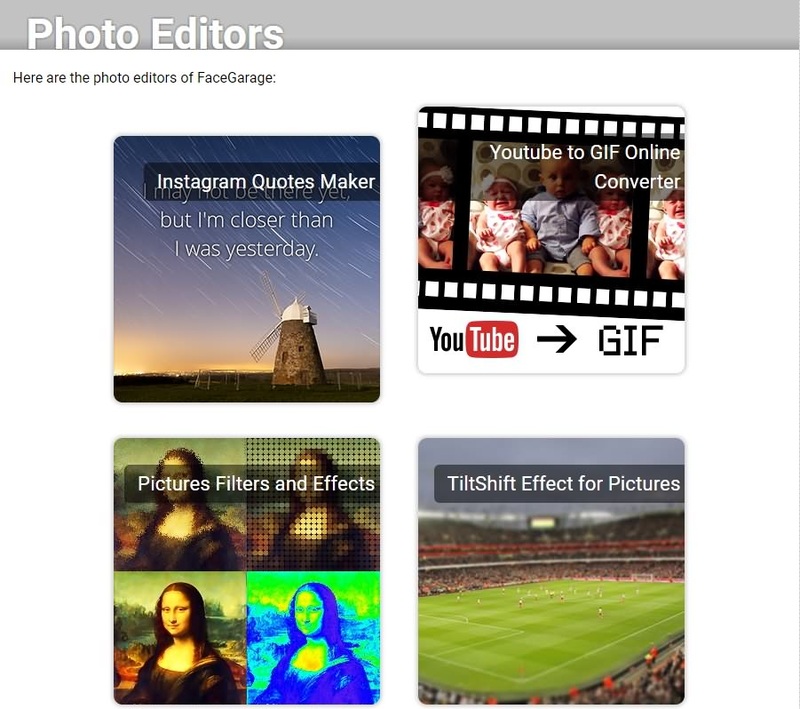 Fotophire Slideshow Maker is a helpful slideshow maker program that can help you to make a photo slideshow with your Instagram quotes. 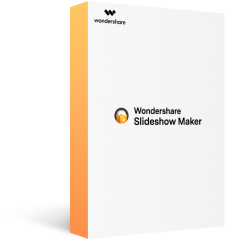 This program is an easy-to-use but powerful slideshow maker that can turn your photos and videos into a slideshow video in easy steps. In this part, we're going to introduce how to use Fotophire Slideshow Maker to make a photo slideshow with your Instagram quotes. Download and install Fotophire Slideshow Maker on your computer, then start it. After that, you can add photos into the program with 3 ways: Drag and drop the photos into program window directly; Click the + button in the center of program window to add pictures; Click Add Files > Add Photos or Videos at the upper left corner of the program window to add files. Now you can click the Theme button at the top middle of the main interface, or click the Next button at the lower-right bottom to enter the Theme section. Now you can select a theme from list in the right sidebar. The slideshow maker offers 26 templates for you to use. Now click the Share button at the top of the program window, or click the Next button at the lower-right bottom to enter the Save or Share section. 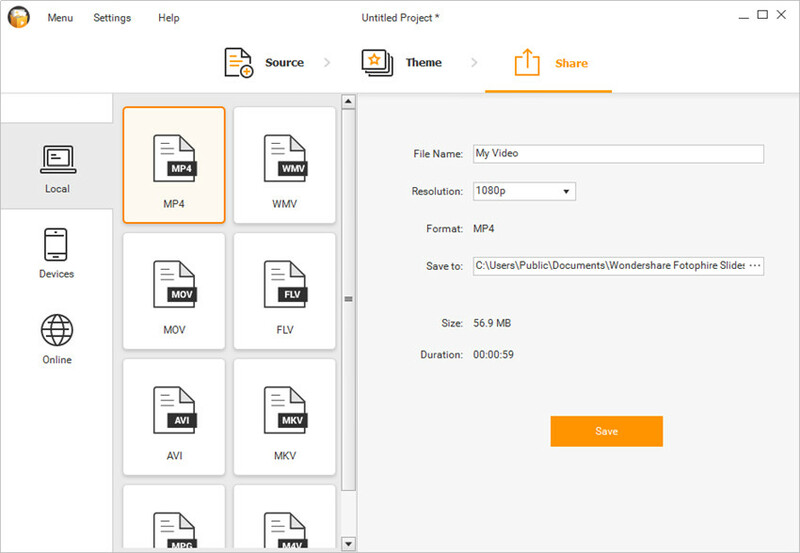 Now you can select the video format you want, and choose a target folder to save the video, then click Save button to save the slideshow video. Or you can choose Online tab, and sign in your YouTube account, then share the slideshow video to YouTube directly. That's it! 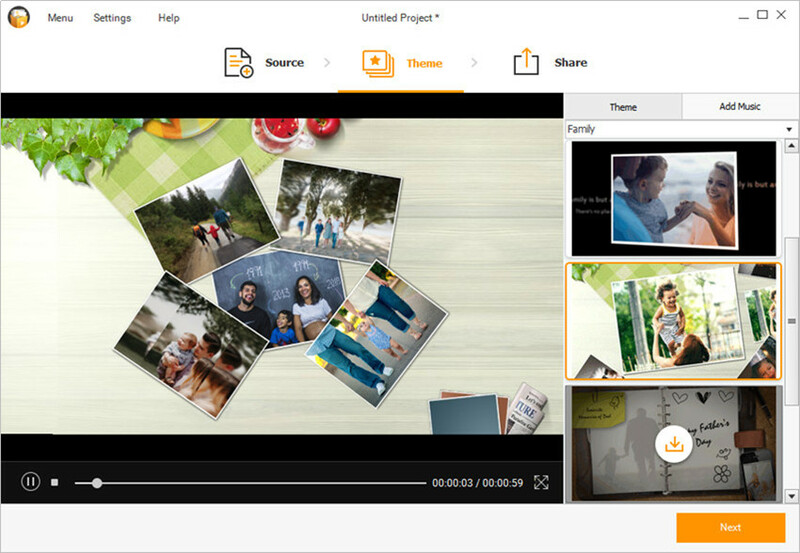 With the help of Fotophire Slideshow Maker, you can make a photo slideshow in 3 simple steps. If you're interested in this program, don't hesitate to give it try.